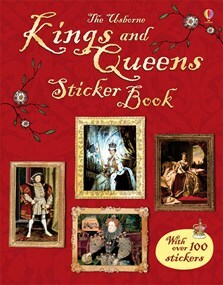 A fun and informative, illustrated sticker book featuring over 100 stickers with portraits of British Kings and Queens from the 10thcentury to the present day. Children can match the sticker portraits to the paintings in the frames on each themed page, which are organised in chronological order and include the Tudors, Stuarts, Queen Victoria, the Windsors and Queen Elizabeth II. Stickers help to fix the images and historical facts into readers’ minds. Includes fascinating facts about the lives, loves and feuds of Britain’s monarchs, with internet links to carefully chosen websites to find out more. A fun and informative illustrated sticker book. This is a gorgeous book, packed with over 100 stickers, and quality pages, illustrations and photos... a must for enticing children into learning a little about British History.